The final STAR WARS trilogy is coming to a thrilling conclusion. 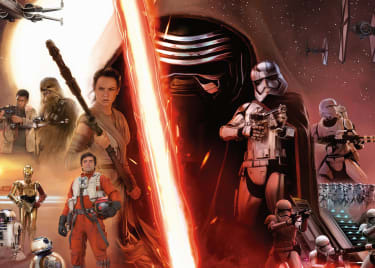 The current storyline kicked off in 2015 with THE FORCE AWAKENS, which introduced new characters Rey (Daisy Ridley), Finn (John Boyega), Poe (Oscar Isaac) and Kylo Ren (Adam Driver). Despite all of the new characters, there are strong connections to the first six movies. 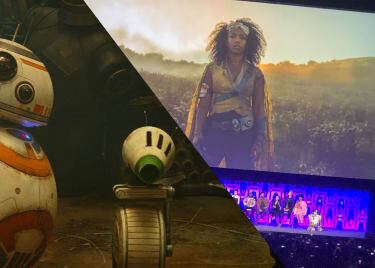 Now, the pressure is on director J.J. Abrams and EPISODE IX to provide a satisfying conclusion — not just to the current trilogy, but to the entire Skywalker saga. 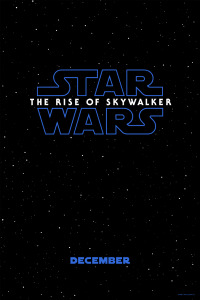 Appropriately, Lucasfilm has given the new film a title that is steeped in the Star Wars mythology: STAR WARS: THE RISE OF SKYWALKER. Let’s break down what the title could mean. Back in the 1970s, George Lucas originally intended to call his protagonist “Starkiller,” but Fox felt that name was too dark. As Lucas himself half-jokingly commented, “Starkiller” just didn’t seem to work as a name. People confused the character with real-life murderers. So, Lucas went with a much more pleasant surname: Skywalker. The Skywalker name has meant several things over the years. In the original trilogy, oriented around the journey of Luke Skywalker, it symbolized hope. Luke was, after all, the boy-turned-man who shot down the first Death Star when he trusted in the Force. In THE EMPIRE STRIKES BACK, he learned the Skywalker legacy is one of darkness as well as light. His father fell to the Dark Side of the Force and became Darth Vader, the Emperor’s right-hand man. The prequel trilogy revealed that the Skywalkers are unique. Anakin Skywalker was the mysterious “Chosen One,” born of the Force itself. The Jedi believed he was destined to bring balance to the Force. In the end, he achieved this on the second Death Star, when, snapped out of his Darth Vader identity, he sacrificed himself in order to kill Emperor Palpatine, the last and greatest of the Sith Lords. 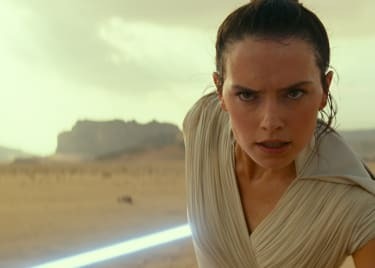 The first trailer for THE RISE OF SKYWALKER reveals that Anakin failed in his mission. “No one is ever truly gone,” Luke’s voice intones. It’s a touching comment on the death of the late, great Carrie Fisher. But those words have a sinister double meaning in the context of the trailer, as a sinister laugh is heard. If nobody is ever truly gone, then the darkness is never truly vanquished either. Lord Palpatine is still alive — or at least present — in some form. The mission of the Chosen One is not yet complete, and the Force remains out of balance. If the Emperor can rise, even as a Force Ghost, then another power must manifest to oppose him. So, there’s a tantalizing question: What does THE RISE OF SKYWALKER truly mean? In theory, the last of the Skywalkers is dead. Luke sacrificed himself at the end of THE LAST JEDI to save the Resistance. That film revealed that Rey is no Skywalker after all; she’s simply the daughter of two nobodies who abandoned her in the desert. But one Skywalker does remain: Ben Solo, aka Kylo Ren, last of the Skywalker bloodline. He’s an angry young man whose story parallels that of his grandfather. The teaser even shows his Vader-like helmet being rebuilt (above). While fans have suspected that this movie might rewrite Rey’s parentage, it looks more like the Skywalker of the title is Kylo Ren. It’s entirely possible that, just as George Lucas wrote the original trilogy as the story of Anakin Skywalker’s redemption, THE RISE OF SKYWALKER will complete a tale about how Anakin’s last descendant returned to the Light — and how he finishes what Anakin began when he attacked his Sith Master. That would be an ideal place to end things, but there’s another good theory about the meaning of the title. In THE LAST JEDI, Luke Skywalker said it was time for the Jedi Order to end. The end of that film, however, showed a young boy manifesting Force powers. Let’s suggest that the Jedi Order could be renamed the Skywalker Order, in honor of Luke and Anakin, and perhaps a redeemed Kylo Ren. In that case, Rey could be the first new Skywalker, but not in a way that requires her parents to be revealed as connected to Luke’s family.